If you are looking for the ultimate in convenience and comfort, Emerald Coast and Destin condominiums can provide everything you need. The alluring combination of excellent location, a range of fabulous facilities and amazing value, is what makes an Emerald Coast condo the ideal solution to your Florida home search. Whether you are seeking a magnificent Destin penthouse blessed with unrivalled views, a cozy Santa Rosa Beach getaway, or a great value Miramar Beach condominium with a host of amazing on-site amenities, there is something for everyone in this breathtaking region. 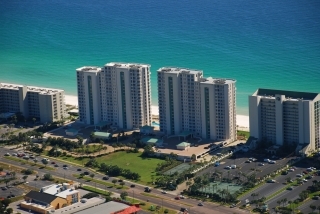 View listings for condominiums on the Emerald Coast, or read more about the Emerald Coast condo lifestyle. The stunning selection of Emerald Coast, FL condos for sale, ensures that you will discover the perfect home, summer retreat, or investment opportunity. Many of the Emerald Coast condominium complexes come with a terrific range of amenities, from pools, tennis courts and fitness centers to secure parking, and magnificent landscaped grounds. The Emerald Coast and Destin condo lifestyle provides superior community living, right in the heart of one of the Florida Panhandle's most sought after locations. Whichever Emerald Coast neighborhood you choose, you will find an array of exciting diversions right on the doorstep, from world-famous seafood restaurants and fashionable boutique stores to deep-sea fishing charters and peaceful nature reserves. Emerald Coast condo owners rarely need to stray more than a few steps to discover many of the wonderful things that make this sun-kissed area so desirable. This is Florida beach living at its most convenient, and relaxing. With all of the great neighborhoods to explore, and wonderful beaches to enjoy, one can always find something new on the beautiful Emerald Coast. To find out more about condos for sale in Destin or along the surrounding Emerald Coast, please contact us at your convenience, or call (850) 830-9502. We are always happy to answer your questions, or arrange a tour. Take a moment to Register on the site and we'll send you listings in your search area as soon as they come on the market.